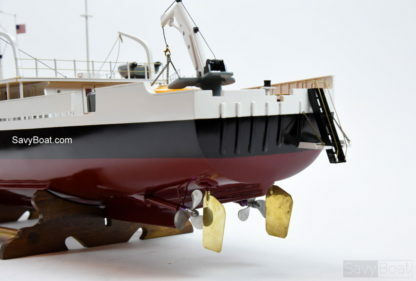 RV Calypso is a scale model of Jacques Yves Cousteau’s ocean research vessel. The Calypso was built in the US in 1942 as a minesweeper. 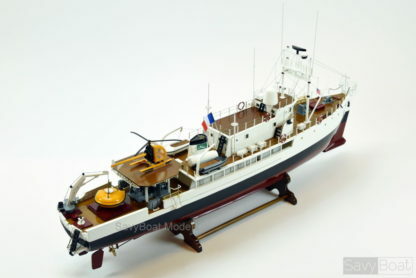 She was bought in 1950 by Jacques-Yves Cousteau, and after extensive changes and modifications has become a fully equipped ocean research vessel, complete with observation chamber in the stern, oval diving bell, Galaezzi diving chamber, inflatable boat for shallow waters, helicopter and other sub-aqua equipment. 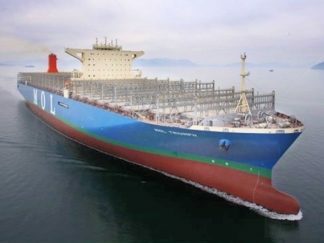 Calypso’s length is 42M, tonnage 360 tons and a top speed of 12 knots. 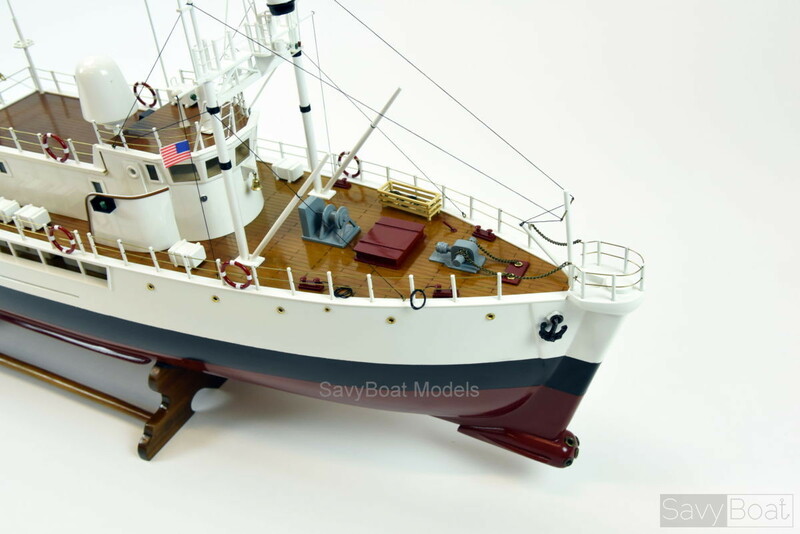 Now you can get this museum quality model of Calypso right in your collection. 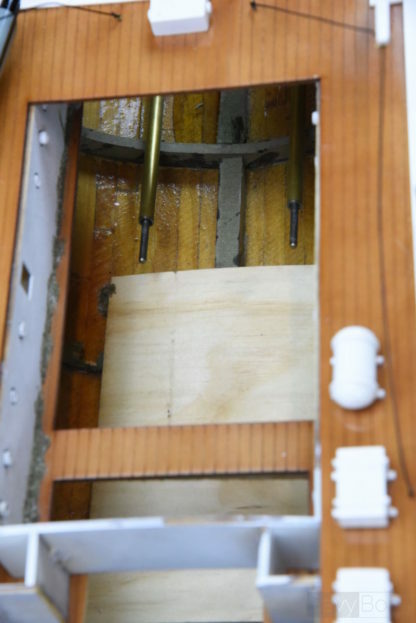 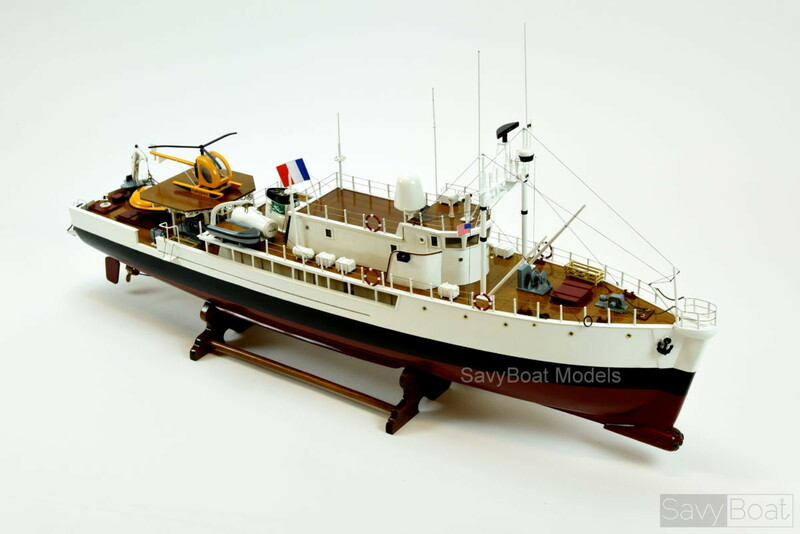 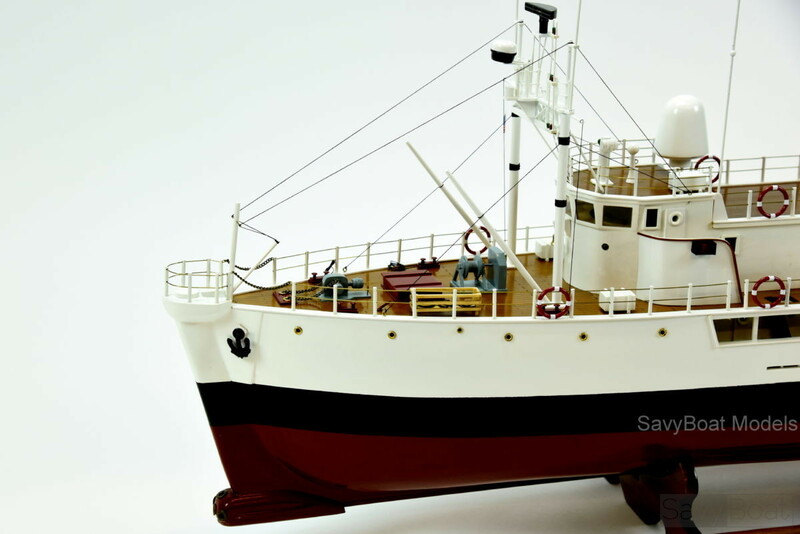 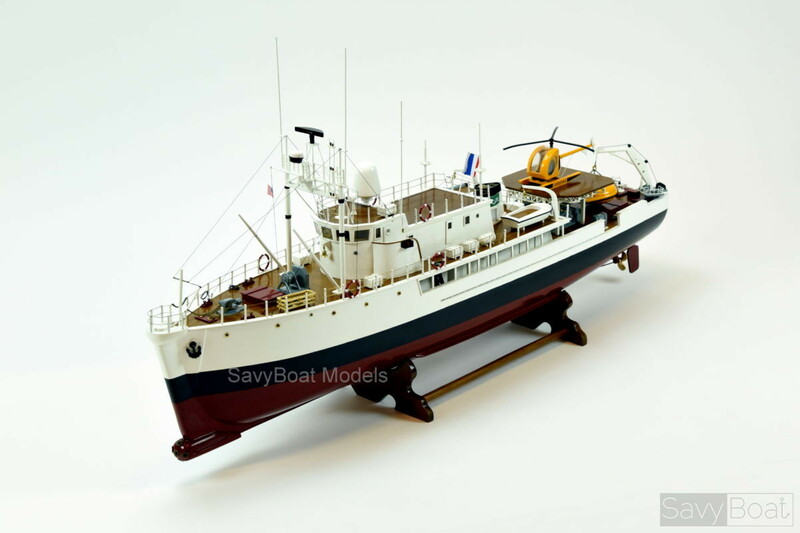 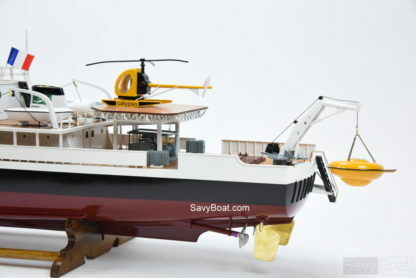 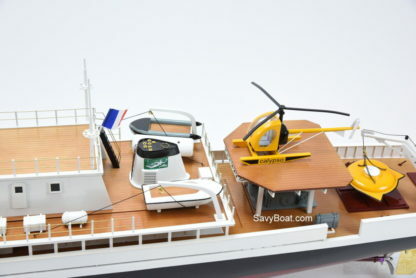 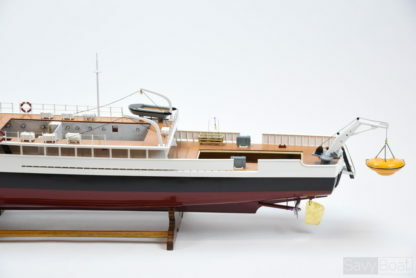 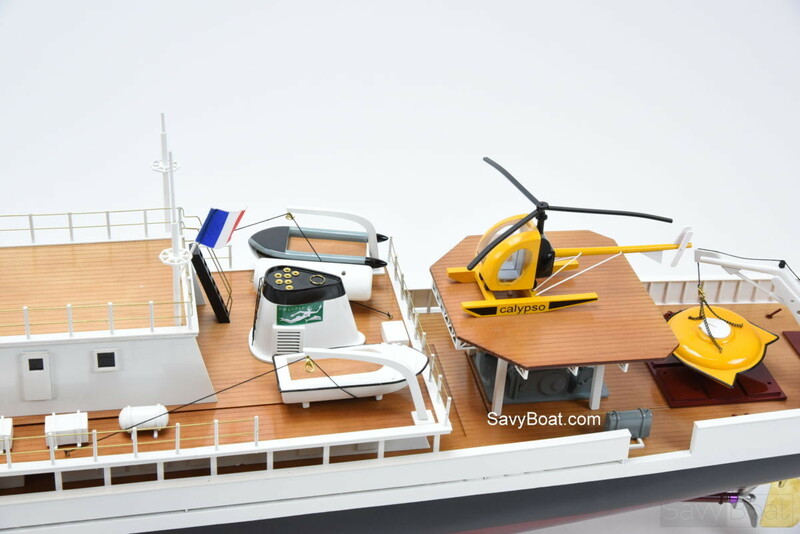 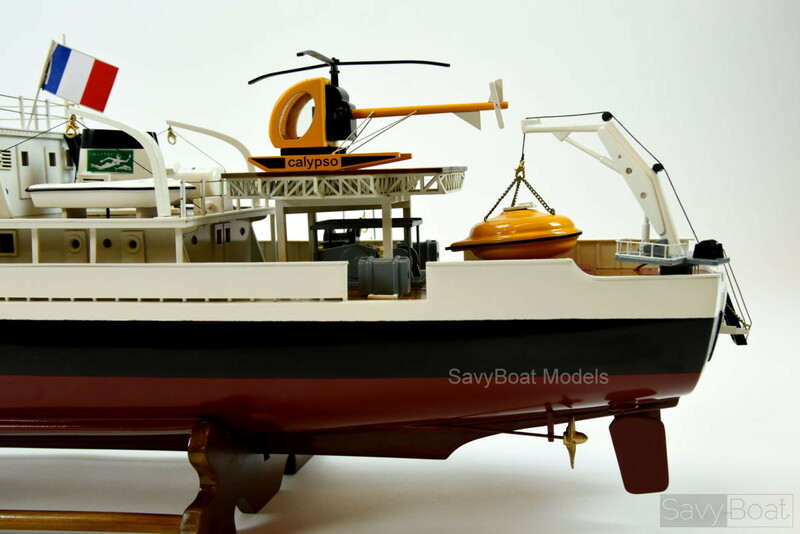 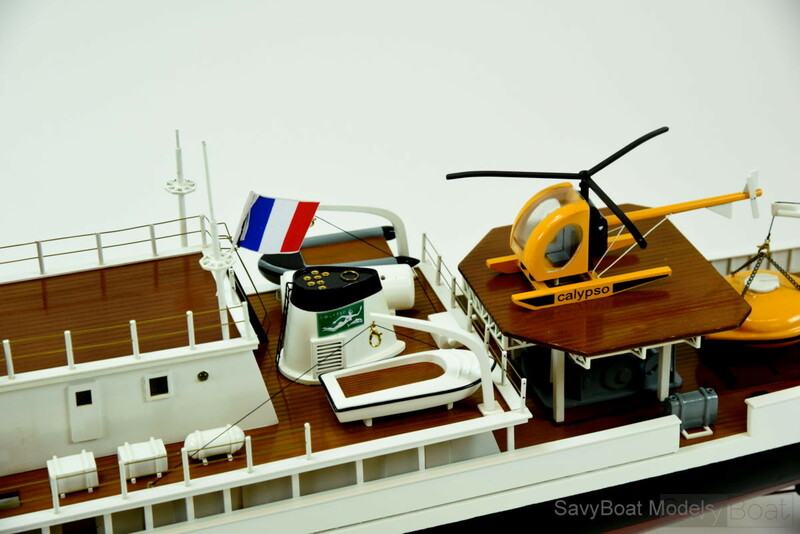 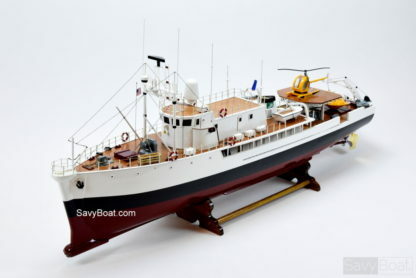 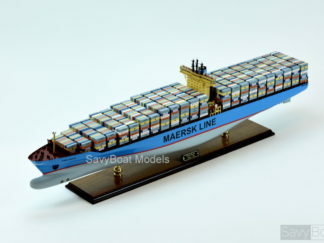 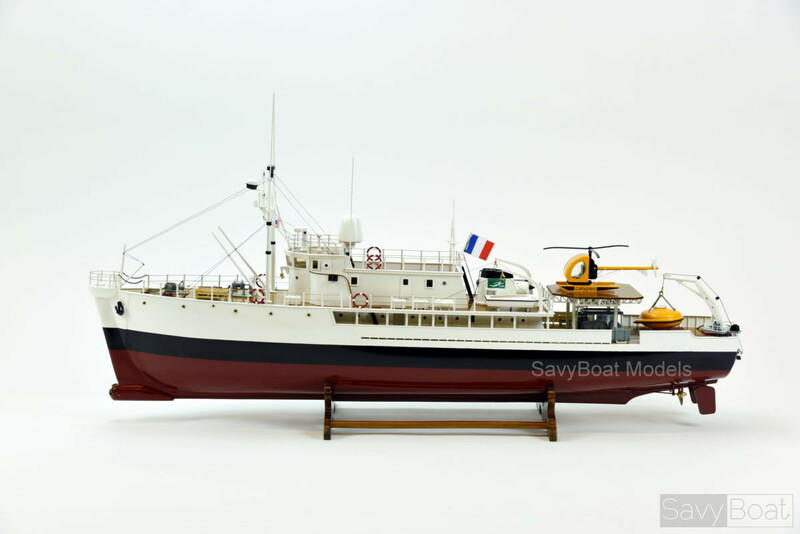 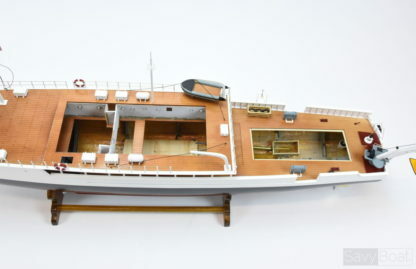 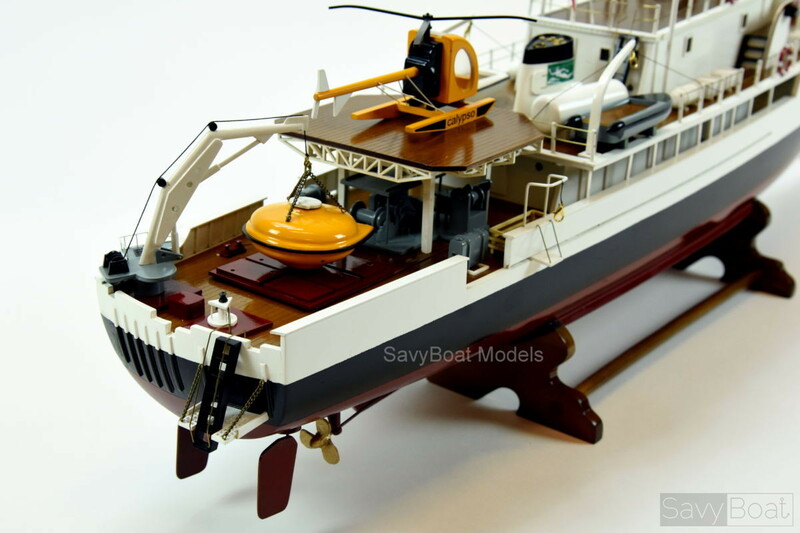 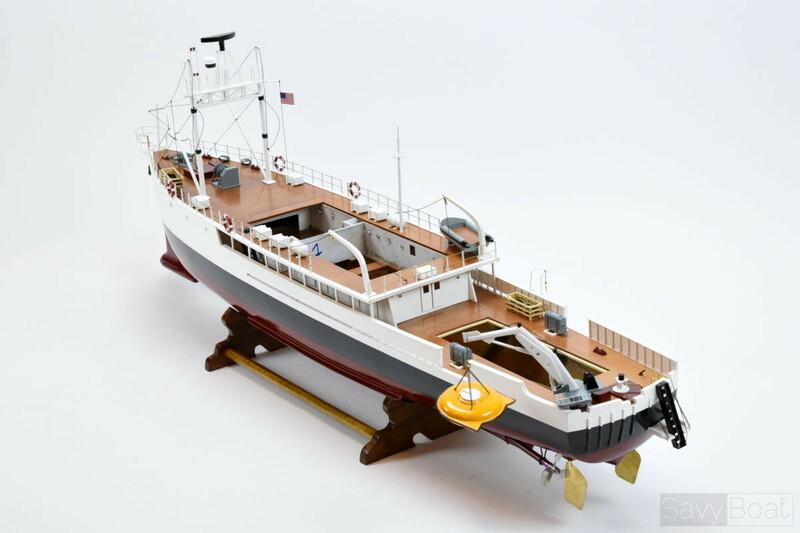 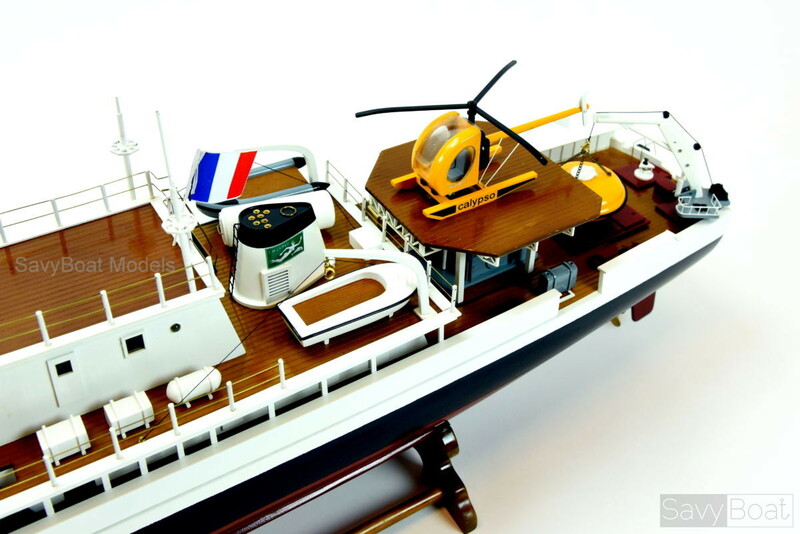 SavyBoat master craftsmen handcraft these nicely detailed models from scratch using historical photographs, drawings, and original plan. 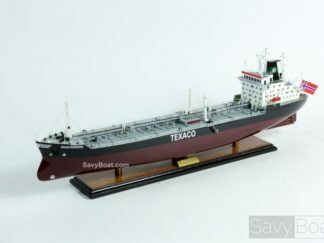 They are built to scale with top quality wood such as rosewood, teak, and mahogany. The Calypso replica is 100% handcrafted individually using plank-on-frame construction method and are similar to the building of an actual ship. Each model requires hundreds of hours to finish and must go through a demanding quality control process before leaving the workshop. 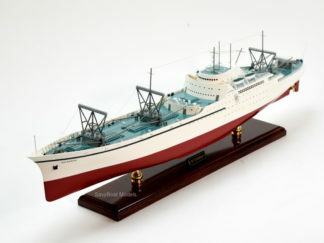 This model is mounted on a solid wood base and ready to display. 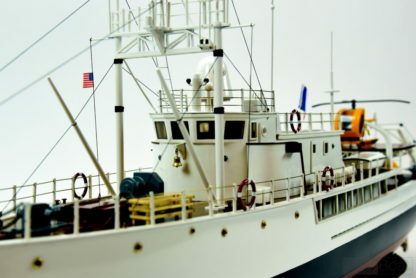 Calypso was originally a wooden-hulled minesweeper, she was made from Oregon pine, built for the British Royal Navy by the Ballard Marine Railway Company of Seattle, Washington, USA. Named after the Greek mythological figure Calypso, the RV Calypso is a former British Royal Navy minesweeper that was converted to a research vessel for oceanographic researcher Jacques-Yves Cousteau, equipped with a mobile laboratory for underwater field research. 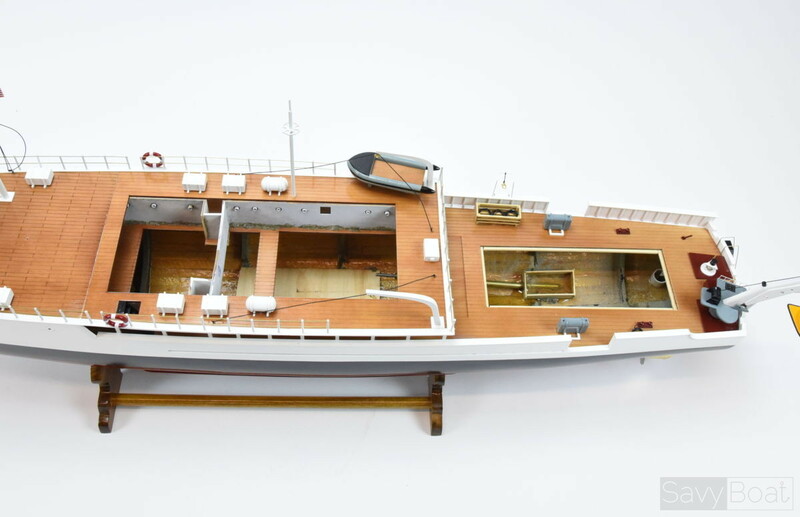 In 1996 the Calypso was severely damaged and was supposed to undergo a complete refurbishment in 2009-2011 in Turkey. 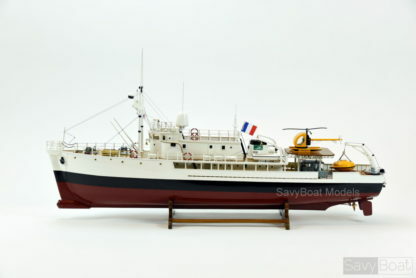 Inventor of the aqualung and fearless scuba diver, Jacques Cousteau opened up the ocean to a mass audience. 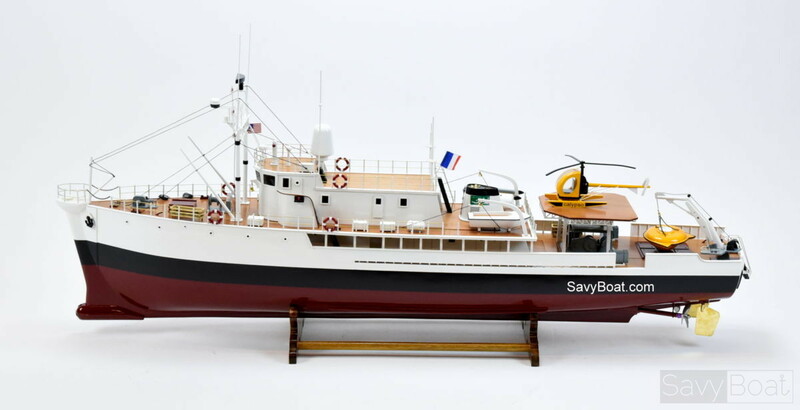 Vividly conveying to people, the science, and the lure of the sea that shaped Cousteau’s life. Now the Research Vessel Calypso is on return to the sea and continues the Journey of Jacques Cousteau’s dream.